We’re happy to introduce a preliminary concept of Bounty Stakes Trading 2.0 that Tokpie exchange is going to launch soon. 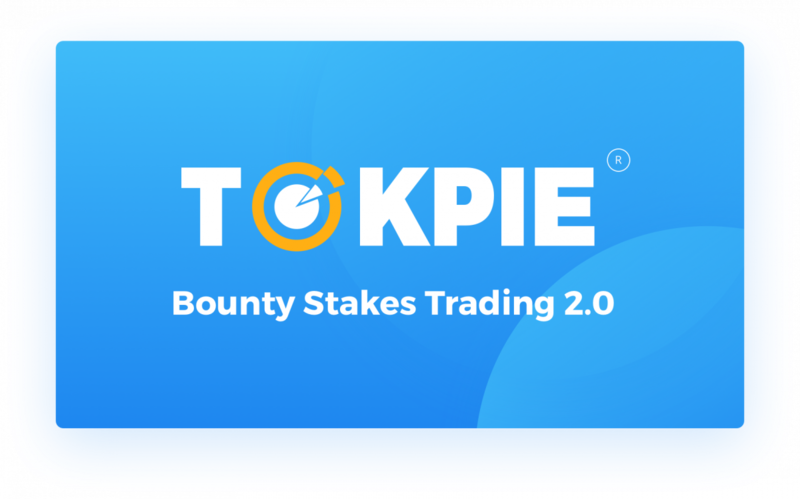 Bounty Stakes Trading 2.0 is an alternative way to deposit and trade bounty stakes that Tokpie exchange is going to launch soon. High eligibility requirements are preventing many projects’ bounty stakes from being listed on Tokpie. The result hunters cannot earn more money by offering its full capacity in participating in many projects. Consequently, investors cannot diversify their portfolios in full by purchasing bounty stakes of many different projects. The limit on the selling of only 50% earned bounty stakes decreases hunters’ profits by two times. The process of stakes depositing is quite complex and time consuming for both sides: hunters and Tokpie’s team. To solve the above drawbacks Tokpie is going to do the following. Hunters could deposit bounty stakes instantly. Moreover, hunters could deposit as many stakes as they want in advance without any limits like 50% of earned stakes. Hunters will be highly motivated to fulfill their obligations and deliver stakes-related altcoins, so no complex checking procedures will be required. Tokpie will be listing bounty stakes of about 40% projects selected from the whole market, which satisfy at least minimal requirements. The result, Tokpie users (bounty stakes buyers and sellers) will be able to trade much more stakes and continue defining what projects are better or worse after our initial selection. First, Tokpie lists bounty stakes of all projects which meet minimal reliability standards but could not be listed under original bounty stakes trading solution. All these stakes will be tradable on TKP So, order books will be of [stake/TKP] type. IMPORTANT: Users could exchange TKP for ETH and USDC at any moment on Tokpie. Anyone (Investor) places an order to buy. The result of a BID price appears in an order book. * IMPORTANT: Hunter cannot deposit a stake if its order book does not contain at least one purchase order (BID). Simply saying: if there is no demand then the supply will be restricted. Anyone (Hunter) deposits bounty stakes on Tokpie by using TKP tokens on its balance as collateral. The best BID price from related order book will be used for calculating the required amount of TKP in collateral. For example, if the best BID price is 10 TKP per 1 stake on the moment of depositing than a hunter must use 150 TKP as collateral (15x). The level of collateral will be between 15x-10x depending on the user’s status. For example, a trial user will be required to provide 15x TKP collateral while Enterprise users could benefit from 10x. Hunter could get his collateral back in full (or partly) at any moment by giving back the same number of stakes (or part), which were initially deposited. It will help if a hunter could not sell his stakes for the desired price and in other cases. If a collateral level is going to be exceeded as a result of trade order execution then hunter could not place such a trade order. No any KYC (documents uploading) for withdrawals below $2500/day and $20000/month. IMPORTANT: Hunters could even deposit bounty stakes which have not been earned yet! Anyone (hunters and investors) can trade deposited bounty stakes until the start of related bounty distribution. Hunter who had initially deposited bounty stakes must transfer related project’s altcoins (due to stake-to-token conversion rates) to Tokpie within 24 hours after bounty distribution has come to the end (or after bounty reward unlocking if such bounty condition exists). Otherwise, a hunter will lose its collateral. * NOTE: If a bounty campaign is successful, but a hunter cannot (for any reason) deliver related altcoins to Tokpie then that hunter lose his collateral. Fortunately, there will be some options to avoid collateral lost by buying back stakes of a related project or its altcoins to settle own obligation. * IMPORTANT: If bounty campaign had failed then hunter will get his collateral back less TKP already received from the related stakes sold. Tokpie is 100% responsible to deposits projects’ altcoins on accounts of holders (buyers) of the related bounty stakes within 48 hours after bounty distribution has come to the end. * If bounty campaign had failed then stakes holders will get nothing like all other hunters. Bounty stakes of Approximately 3 new projects will be listed every week. This will lead to 120-200 bounty stakes from 40 different projects listed simultaneously on Tokpie when Bounty Stakes Trading 2.0 works in full power. PROS for Hunters: Thanks to many different stakes & projects listed, hunters could earn much more money. Hunter doesn’t need to make deposit requests, write texts, upload screen-shots, etc. Hunter may plan how much stakes he could earn on bounty campaign to deposit all of them at once and sell! Then convert TKP to ETH and USDC in seconds! 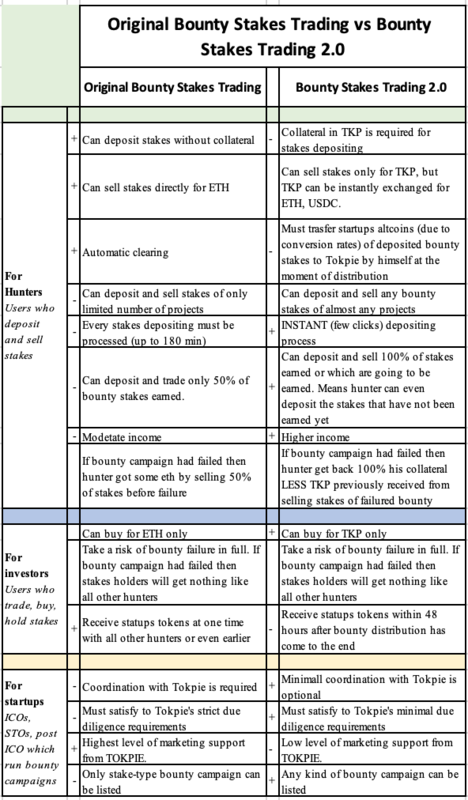 The table below shows the differences between original Bounty Stakes Trading solution that Tokpie exchange will continue provides and Bounty Stakes Trading 2.0. Thanks to many different stakes & projects listed, Tokpie will have a reason to launch a unique Bounty Analysis tool for automatic calculation of all bounties capitalization in real-time. It will help hunters/investors to track and select the most profitable/promising projects in seconds. Also, projects with the best caps and volumes might be listed for free. Bounty Stakes Trading 2.0 will accelerate TKP turnover and create a demand for the next solution that will allow users to lend/borrow TKP with market-defined interest rates.